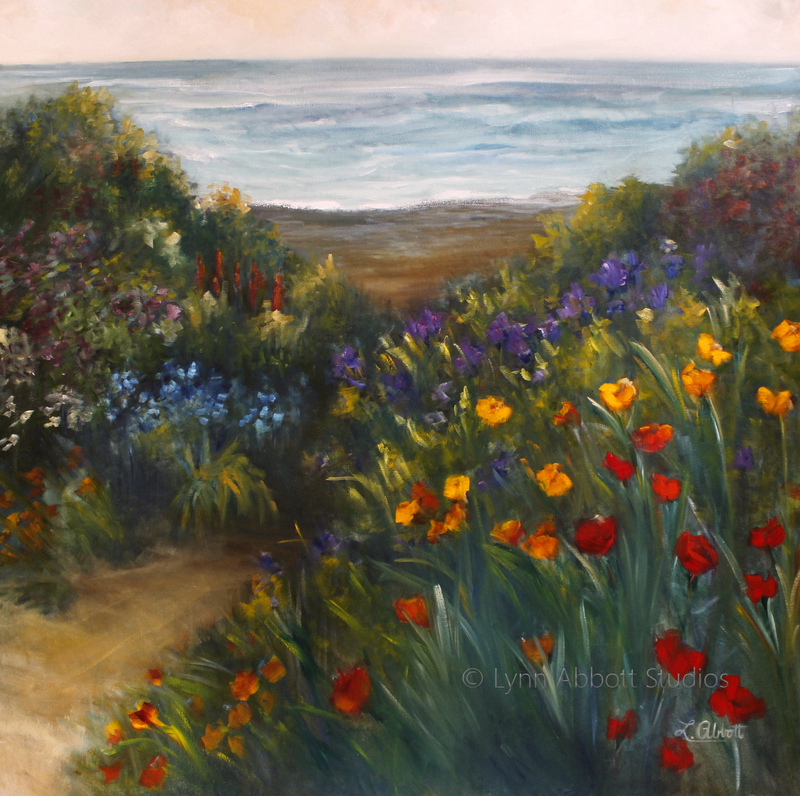 “Bloom Where You’re Planted,” © Lynn Abbott Studios. Used with Permission. Necessity birthed creativity in me. Since my parents had little money, I learned to create rather than buy stuff. As a family, we made do with hand-me-downs and “Penny Saver” finds. Life had planted us in some difficult financial circumstances. But I was complete unaware of the potential financial tsunamis my mother feared as she leaned over the old mahogany secretary desk to make careful marks in her large, black ledger. Thus, one Saturday morning over Kellog’s Rice Crispies I described the carry-along house to my father. In response to my daydream, he pulled out a miraculous cardboard box, an Exacto Knife and the always useful, silver, duct tape. Unfortunately, I lost sight of that valuable wisdom somewhere along the way. In high school, I began longing for store-bought clothing like that of my friends. And with earnings from part-time jobs, I purchased stuff. Looking around me, I saw what my school friends had. And I longed for more. My dreams extended beyond the material, however. I also wished I could recreate my appearance: acquire a more Grecian nose, a shorter neck, or a change in hair color or texture. Don’t get me wrong. Working hard or trying to improve can be a good thing. The apostle Paul, in fact, admonishes, “Whatever you do, do your work heartily, as for the Lord rather than for men,” (Colossians 3:23). But when those things draw my attention away from Abba, the “worries of the world” choke out the seed of faith, (Matthew 13:22). This much I know to be true–when that perpetual spirit of discontent distracts me, the broad shortcut begins to look attractive. After all, our culture and Madison Avenue encourage such a path. If there were any doubt of our passion for “more,” our recognition of growing personal and national debt would close the argument. At some point in life, the lure of “more,” or “new and improved”–the longing for the beauty, accomplishments, fame or fortune of others– plagues us all. We even long for good things. Yet, we compare our circumstances to others. As an impatient and discontented spirit grows, you and I falter. Let’s face it. The never satisfied, “I want it now” drives many quarrels. At its most extreme, it gives rise to war in this world, (James 4:1-6). Discontent invariably makes a mess. I know this. Nevertheless, periodically, the monster “Malcontent” rears its ugly head. In response, I impatiently run ahead of Abba. In such instances, I’ve grown weary of my life’s lot, and instead of waiting on God, I push ahead. That always spells trouble. However, Jesus responded, “It is written, ‘Man shall not live by bread alone but by every word that proceeds out of the mouth of God,'” (Matthew 4:4). From the outset, His earthly circumstances did not promise much. Our Savior had planted himself in difficult soil when He took on human form. Yet, He focused on His Father. He trusted His Father to supply what was needed at the proper time. Sarah, Abraham’s wife, became discontent in her circumstances even though God had promised Abraham and Sarah a child. Thus, instead of persevering in faith, she took matters into her own hands. She suggested that Abraham should father a child with the help of her maid servant. And her plan sowed long-term trouble. Even so, our God remained true to His promise. Grace trumped Sarah’s discontented disaster. Of course, my mother used to remind me that I could not pick and choose my personal qualities from a catalog. And she also noted that things wear out and must be replaced, (Matthew 6:19). Mom was right. The quest for “more” is never complete. Thus, when I pursue the makings of life without Abba, I become like Mary Shelley’s Dr. Frankenstein. I create a monster. Ignoring God and going my own way is like that. It’s tremendously empty despite what the world promises; it’s an endless chasing after things and transformations that never seem to fulfill. Even Solomon, the wisest man who ever lived, wandered. He describes his resulting disillusionment and discontent in detail in Ecclesiastes. Yet, he concludes his treatise with hope: “Remember also your Creator in the days of your youth, before the evil days come and the years draw near when you will say, ‘I have no delight in them,'” (Ecclesiastes 12:1). Actually, when I ponder his words, I realize that in this instance my interaction with my earthly dad particularly parallels my relationship with my heavenly Father. You see, the cure for my childish discontent was time with my dad. Herein lies the key to contentment. When you and I find ourselves impatiently discontented in the “whatever” life hands us or in the “wherever” our journey takes us, we need only talk to our heavenly Father about it. I may not like my current circumstances. Indeed, life may throw tremendous obstacles in my path. Thus, as I wait for His plan to unfold, I turn to my Heavenly Father. He helps me create beauty from the “whatever” I encounter “wherever” my walk with Him may take me. In fact, you and I will find greater joy in what we do with Abba than anything this world can give. Yes, in Him, we find grace sufficient to bloom wherever we are planted.